Bass divider, sustain, footage selector, and tone circuit board on the V303E organ This card is mounted to the lower side of the the drawbar board. 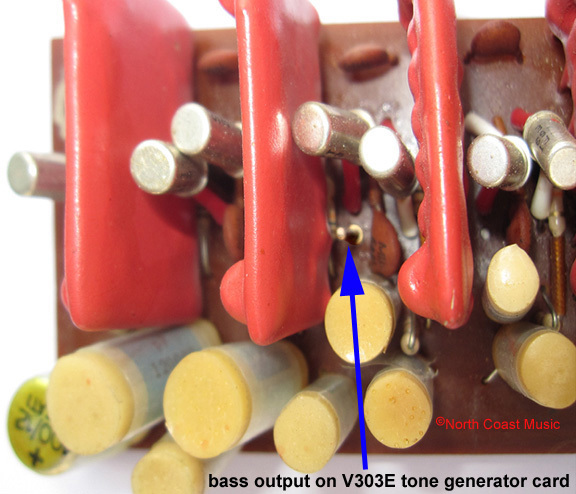 Top of picture: V303E "keying" circuit board- combines tones from the organ tone generators to the lowest bass key played. Also shown, in foreground, is the multi pin connector for the optional bass foot pedals. The option never came to pass for the V303E. 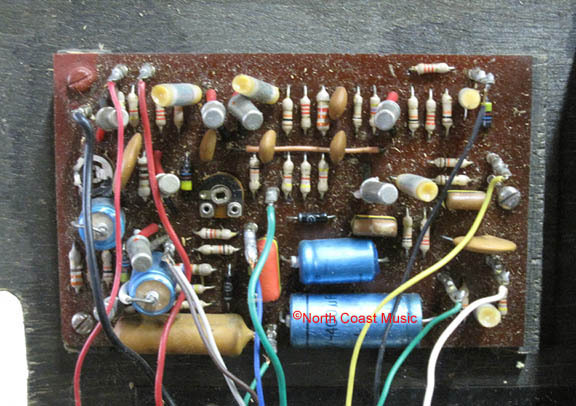 This circuit board is mounted to the bottom of the organ, near the power supply. The V303E Vox Super Continental also featured a section of thirteen bass keys in the bottom octave of the lower manual. Unlike the Vox Jaguar Organ, which has a similar octave of bass keys with white naturals and black sharps, the bass keys in the Super Continental maintain the standard "black for naturals, white for sharps" Continental color format. Two drawbars controlled the volume of the bass keys. The left "~" drawbar had a "flute" tone and the right "M" drawbar had a "reed" tone. 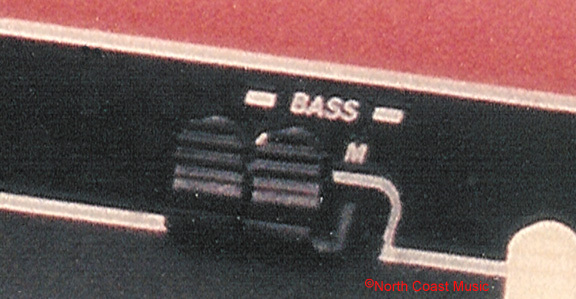 In addition to the drawbars, a switch on the control panel allowed the selection of a 16' (lower) or 8' (higher) bass tone. It also included a"Bass Sustain" control. This rotary control adjusted how long the bass key sustained after release. By increasing the control, the tone sustained briefly as the volume of the note decayed, simulating the effect of a string bass after playing the string. The tone for the bass keys orginates in the twelve individual tone generators. In the picture second from the top, a blue arrow points to the connecting pin for the tone generator output to the bass key circuitry. 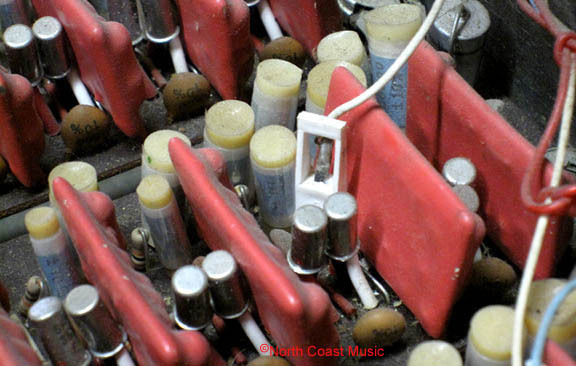 A small plug in the wiring harness connects to this pin to feed the output of the fifth divider to the bass key circuit board, as shown in the fifth picture from the top at left. 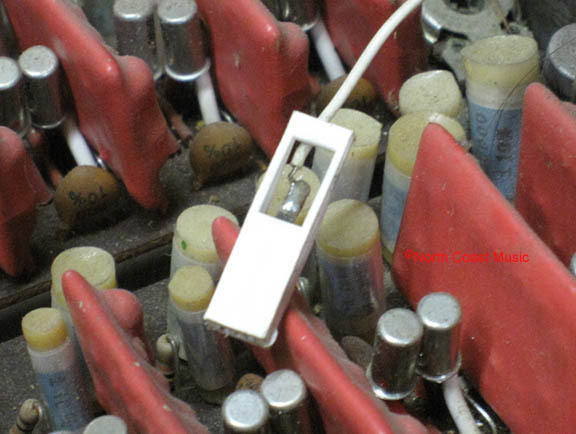 If an individual note is not working in the bass section of a V303E Super Continental, making sure that this small white plug is connected to the corresponding pin on the tone generator is the very first thing to check. A second circuit board, mounted to the underside of the hinged drawbar board, controls the features of the bass note section of the V303E. Two frequency divider circuits, similar to those used on the tone generator cards, modify the pitch of the bass section and allow for a selection between 8' and 16' bass tones from a control panel mounted rocker switch. This same circuit card also filters the tones to generate the flute(~) and reed (M) bass tones. The bass sustain circuit is also located on this card. By rotating the "Bass Sustain" control on the control panel of the V303E organ, the sustain decay length of the bass notes may be increased or decreased. 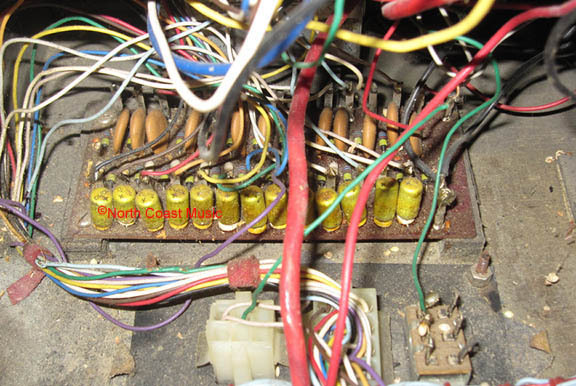 A multi pin connector located on the bottom of the V303E Super Continental was designed to connect an optional foot clavier (bass pedals) to the organ. However, I have never found any evidence that these bass pedals were ever produced for the V303E Italian Super Continental. No optional foot clavier is mentioned in any US Vox price list between 1966 and 1970. JMI (British) Vox offered an optional foot clavier for their V303J Continental II, but the connecting plug was incompatible with the V303E.